I am not a GIS Expert. I'm just a guy who likes to paddle and who has spent far too much time looking at screens while trying to find and download maps. Hopefully, someone here can benefit from all those hours of eye-straining activity. I'm going to detail how I find and download Canadian topographic maps using Google Earth. I then mark up the maps with routes, waypoints, grids etc... and print maps directly from Google Earth. But, that part will have to be a post for another time. Learn how to navigate and use it! The Government of Canada has made KML/KMZ index files for use in Google Earth (a KML/KMZ file is a file that Google Earth can open). These index files include Toporama collarless map index, CanTopo Collarless index, CanMatrix 50k index and CanMatrix 250k index. There may be others but these are the ones I find most useful. 3. Open the index files with Google Earth. In Google Earth choose File - Open - Navigate to the downloaded file. When you open one of these files for the first time. Google Earth will zoom out and show a view of Canada with the index overlaid. This may slow down your computer. Once you have zoomed in on an area and checked the index file you will see a satellite photo of the area with a grid overlaid and a number inside the grid. For example 106H10. Click on this number and you will see a preview of the topographic map. At the bottom left corner of this map preview is a link to the full download. In this example canmatrix_106H_tiff.zip. Clicking on this link will download a zip file of the map. During this process, Google Earth will show an error. Ignore it. The error is because Google Earth does not like zip files. Your default internet or FTP browser will also open up and start downloading the ZIP file. The Zip File contains a tiff file (image) of the map you are interested in. For those with limited bandwidth beware these files are huge. You now have your topo map! Extract the contents of a Zip file to a folder on your computer. You should see large .tiff files in this folder. Drag one of these tiff files into Google Earth. Literally left click on the tiff file. Keeping the left mouse button pressed drag your file and drop it onto the Globe in Google Earth. Google Earth will zoom to the area covered by your map and open up a dialog window asking what you want to do with the file. Select 'Create Super Overlay' and follow the instructions. You now have zoomable high resolution topos in Google Earth. From this point, you can start creating, marking up and printing your maps directly from Google Earth. I'm not going to go into that. 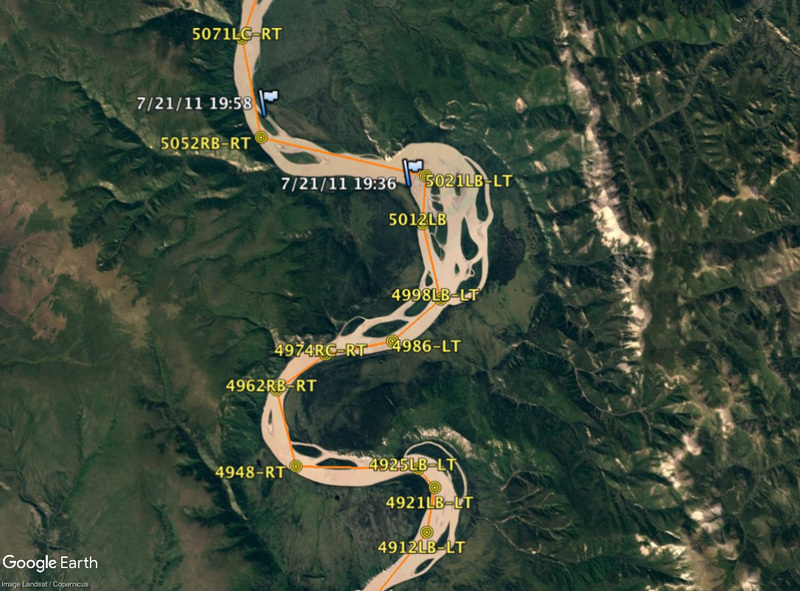 But, here are some screen captures of a route with Collarless Toporama Superoverlays created in Google Earth. Martin, this looks great. I'll take a look at it more later when I have more time. @Rab it was your post that prompted me to write this. I hope you find it helpful! This looks great! Now I have to get to work. I'll see if my limited processing power and storage can handle it. Awesome information! Thanks for the tutorial! The geo-registration does not work. How do you account for the differences in datum? Google Earth is set to WGS-84 datum ( not changeable as far as I know). But the topo maps are referenced to NAD27 datum. So you will get a position shift if you overlay the topo on GE. Here is a segment of my Yukon River race route map with waypoints (labeled in tenths of a mile beginning from Whitehorse). I know from being there 4 times that registration of my route and waypoints using the GE mapped waypoints is accurate with reality. However, when the Nad27 topo map is overlain, there is a dramatic shift in the route and waypoints, since they are WGS-84 but the map is not. Another issue I would have is this river ( and I assume other similar far northern Canadian rivers) are not static. Many of the islands, shoals, cutoffs change almost every year. I have seen signficant changes in the river ( and GE images) in the course of a single year. This particular topo map dates from surveys taken way back in 1962. Nessmuck, got me! Disconcerting that the Google Earth satellite imagery and your GPS track do not line up with the CanMatrix Map overlay. I tried to replicate the issue and couldn't. In the image below I have changed the transparency of the 1:50k Mount Gladman Canmatrix topo on my computer so that I could see the underlying Google Earth imagery. Unlike your screenshot They line up exactly. I'm not sure what's going on there. I tried again in a different way with a semi-transparent topo overlay on GE and here is the displaced result. By the way, there is virtually no difference between NAD83 and WGS 84 datum plots when using consumer grade equipment. I was able to interface it with my basecamp program, where you can choose the datum field that is best. Most on the topos I use are Nad27, so I leave basecamp in Nad 27 as well. There is quite a discrepancy between WGS 84 and Nad 27, which has caused some folks problems when I send them maps. It's one of those things that a lot of people don't realize. Just as a point of interest, most of those Nad 27 maps are from aerial photos from around 1927. I still have the entire set of aerial photographs of Ontario, used to construct the maps, along with the stereoscopic eye piece to view them. They take up an entire four tier filing cabinet, as well as four other boxes. As Nessmuk stated, there are quite a few discrepancies for river travel, even if your GPS is plugged into the correct datun field. Could be from the rivers moving, or perhaps inaccurate transcribings in the first place. 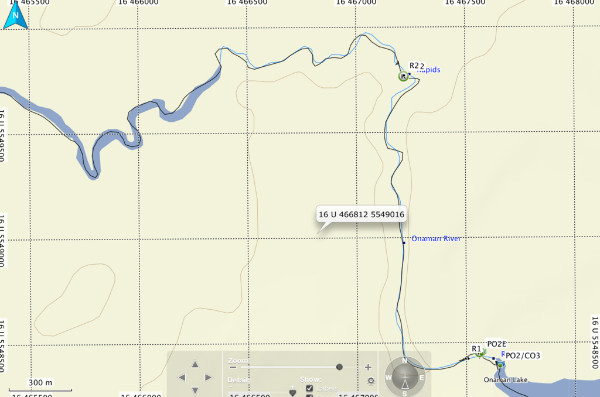 For instance, this track of the Onamon river was done with basecamp set to nad27 and my GPS set to Nad 27. Sometimes I think it was better to navigate when some things were still a mystery, because the technologies creates its own mysteries. Here's a blow up that shows the discrepancies better. Last edited by RHaslam on April 29th, 2017, 9:40 pm, edited 1 time in total. For what its worth, I find that creating a GPS waypoint route directly from Google Earth to be very accurate. 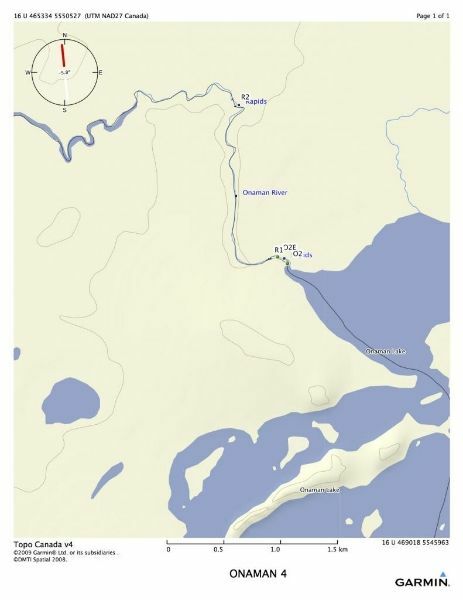 I print out the maps with waypoints and routes thus created, numbering 95 maps to comfortably cover sufficient detail on the 1000 mile Yukon canoe race (Whitehorse to the Dalton Highway Bridge), and 64 maps for the 440 mile "sprint" ( Yukon River Quest) from Whitehorse to Dawson. I do the same GE routing process for shorter local races here in the NE U.S., even where I do not need maps. The Garmin GPS maps that you can buy to load onto your device are also based on older surveys. In places on the Yukon we were paddling where the Garmin map indicated we should have been on dry land. In other places the earth was literally caving in where undercuts were active while we paddles on by. You can never trust from one year to the next exactly where shallows and gravel shoals will be. But GE images are typically only less than a few years old and reflect reality pretty well. Maybe I'm missing the point here but if it's just topos with UTM grid lines you are looking for,why not just use Gmap4 to print? Many people like to plan with Google Earth. The point of this post was just to show how you could incorporate Topographic maps into that tool. Caltopo, Gpsvisualizer, Gmap4 are all useful too. Caltopo lets you print at various sizes and scales with different grids. But, you have to pay for that feature. How do you print scaled drawings in Gmap4? It's easy to share Google Earth files with other trip partners and the file contains all the other added info such as route, mileage markers, etc. I'm not sure what you mean by scaled dwgs----I don't worry too much about having everything on the same scale as long as it's approx the same. I could not print with Chrome but no prob with Firefox.